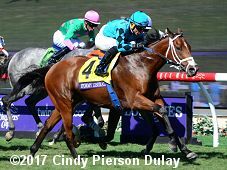 A full field of 12 older horses contested the $1 million Breeders' Cup Turf Sprint (G1) going 5 furlongs around one turn of the Jimmy Durante turf course at Del Mar. King's Stand Stakes (G1) Lady Aurelia was sent off as the 9-10 favorite off a close second in the Nunthorpe (G1) at York. 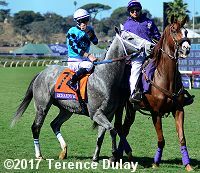 In to challenge her included 5-1 second choice Disco Partner, winner of the Belmont Turf Sprint, and 6-1 third choice Marsha, 2nd in the Prix de l'Abbaye de Longchamp (G1) at Chantilly after winning the Nunthorpe (G1). Kendrick Carmouche sent 11-1 Pure Sensation to the lead through fractions of 21.98 and 44.57 while pressed by 14-1 Richard's Boy and stalked by 29-1 Bucchero. Pure Sensation led to the 1/8 pole but tired while 30-1 Stormy Liberal, 6th early under Joel Rosario, rallied to win by a head over Richard's Boy in 56.12. 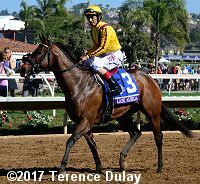 It was 1/2 a length back to late-running Disco Partner third, while Lady Aurelia checked in 10th beaten just 3 lengths. Left: Stormy Liberal heads to the winner's circle. Winning jockey Joel Rosario said, "I just break out of the gate, and I asked my horse a little bit. Peter told me don't, just get your position, and he has a lot of speed, but he wanted me to just like follow and save some ground and just stay on the inside. And that worked out perfect. I broke there, and looked like they were going very fast in front. I was just trying to save some ground, just like Peter told me, and take it from there." Right: The trophy presentation for the Turf Sprint. Winning owner Gary Hartunian (who owns the first two finishers) said, "I claimed Stormy Liberal for $40,000. So those people right now are jumping off the Coronado Bridge. 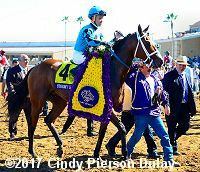 Then (runner-up) Richard's Boy, a friend of mine at the track came up to me and said, you know, you want to buy this horse privately, so I bought him privately." Left: Stormy Liberal heads out to the track before the race. 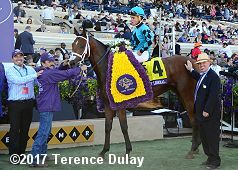 Right: Stormy Liberal parades with his flowers with trainer Peter Miller to his right. Miller, who trains the first two finishers said, "It was just a surreal experience to see Richard's Boy look like he was going to win. And I'm watching Joel, and I'm rooting for Joel, and I'm like just one of you win, just one of you win. Somebody win, you know? 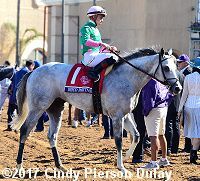 And to run one-two here for my first Breeders' Cup and here at home, I live ten minutes away in Encinitas, is special. 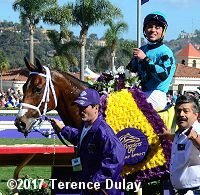 And to win with Joel Rosario, who I consider a good friend and who rode a lot for me when he was out here, just one of the best riders in the world." Left: Second place finisher Richard's Boy enters the turf course before the race. 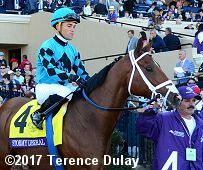 Jockey Flavien Prat said, "He ran a really good race. He just got beat by a neck." Right: Third place finisher Disco Partner returns after the race. Jockey Irad Ortiz Jr. said, "I had a good trip. Five furlongs is just too short for him. Five and a half or six is better for him. He gave me a good kick." Tenth place finisher and beaten favorite Lady Aurelia returns after the race. 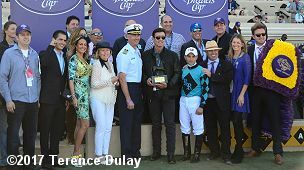 Jockey John Velazquez said, "I had a perfect trip. There were a couple speed horses so I let them go. I got into a spot I wanted at the 3/8 pole and she was just flat down the lane."